I last road an FJR1300 in 2005 when I had the privilege to secure a long term machine for use on the MSL Tours program for that year. Five years is a long time in motorcycle development and a lot of miles have passed under our wheels in that time. Since then I’ve spent a year on a BMW 1200GT another with a Honda Silver Wing scooter, a BMW 1300GT and a Honda CBF 1000A tourer. The 1200 was a new model and needed some adjustments in the mapping department before it would run properly. For personal reasons I went with the scooter and found it taught me that you could tour on anything as long as you plan the journey. That year I did all the tours on it including taking it to Slovakia and the Tatra mountains. Next came the BMW 1300GT which I covered 15000 miles on and once the handle bar switch gear had been sorted I was happy to ride it for the year. 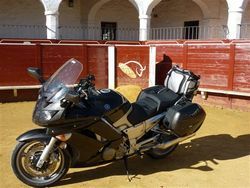 A couple of days after collecting it from the Yamaha HQ in Weybridge I was on the cruise to Santander for the MSL Tours Andalusian tour with nineteen other bikes. Riding the bike felt as though I back with an old friend. Nothing much had changed. A lockable ‘nik nak’ pocket, twin headlamp adjusters and heated grips was all I could remember different from the older model. The generous sidecases held all of Gloria’s luggage and the lockable ‘nik nak’ pocket took mine. 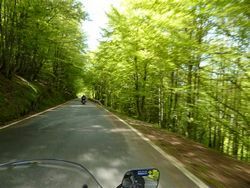 Leaving the scramble of Santander around mid day we had 200 miles on good roads to cover before our first hotel. The comfort from the heated grips was well appeciated as the appearance of snow on the distant Picos de Europa sent a shiver down my back. Rider comfort is a strong point with the FJ. 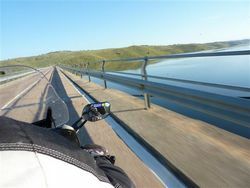 I seem to be well suited to the riding position with the electric screen fully up the bike just glided along the newly constructed A67. No problems from the pillion seat either. Footrests were nicely positioned and helmet turbulence at the national speed limit was at a minimum. Our route was down to Palencia then across the long straight flat countryside to Aranda de Duero, joining the N122 to El Burgo de Osma. It was a cold ride but the welcome was warm. Its true that in Spain that you seem to get a ‘waiter for life’ and this guy in the bar has been there for years and welcomes us as old friends, it’s a skill that these guys have. On top of that he speaks English but never moved outside El Burgo his hometown, he tells us that we are the only English to visit the hotel, amazing. Then local speciality soup – not so special! To finish a dessert of Tiramisu and ice cream cake. Complemented by a plentiful supply of local red wine from the Duero River region and coffee. Goose barnacles are an expensive speciality. In Spain they are mainly found off the coast in Galicia and cost around 100euros per kilo. Starting the day with a full fuel load of 6.6 gallons I knew I could get 200 miles with out a worry for fuel. The bike had been averaging 50.4 mile per gallon during that first stage so I knew I would get down to past Madrid before a compulsory stop. Shortly after set off we had a few nervous seconds as we approached a police checkpoint, not 10 miles from the hotel. But once the Guardia Civil had seen the UK registrations they waved us on and we didn’t even stop the motors. This next stage was 350 miles, which took us around Madrid on the M50 ring road to pick up the A4 directions Granada and into Andalusia. 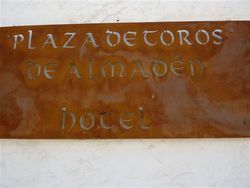 Our hotel was at Priego de Cordoba, a small village hotel surrounded by olive grooves and one we had used this before. Winter weather had washed out many of the entry roads to the village one of them being the one we had suggested the group to take, eventually after some pretty wild ‘D’ tours three of us joined a fully tarmac road leading to the hotel. I never realised how good the FJ would be off road! Once again we were greeted by the ‘waiter for life situation’ it was Antonio the same guy who had been there on our last visit. We were booked in here for two nights evening meal both nights but no free wine. It didn’t matter since the bar was good and cheap, gin and tonic 2.60euros and beer (cerveza) 1.40euros. After the rest day it was a short but demanding 150 miles leg down to Los Barrios via Ronda to have a look at the famous gorge – if you can park! The day’s route sent us down the twisties leaving the main highway route via Malaga to the tourist traffic. After those long straight stretches of autovia from Madrid it was time to re profile the tyres around some of the mountain roads of the A333, A367, A369, which are lined by green on Michelin. Up until now the comfort of the FJR had been paramount. I fitted the bike, the riding position was great but now on roads that demanded flickability I looked for a different virtue from the Yamaha. Here I felt that the FJR could have done with an update. I was having to haul the bike from side to side it didn’t roll as I expected and I was having to put in a lot of effort to put it through the flip flop bends. I checked the tyre pressures to find them spot on but the front tyre was wearing badly which I can only assume was the problem with the heavy steering. The bike though is a heavy 283kg compared with the BMW 1300GT 249kg. We arrived at this next hotel at Guardacorte Park just ten minutes from Gibraltar a convenient sight seeing location. The tour formula changed here and we ate out in nearby restaurants. 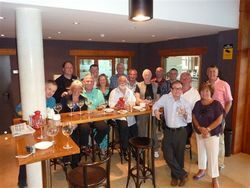 It was an experience and a brilliant laugh as weslowly demolished the succession of moreish tapas of fish and meat. Back on the road after three days of carnival at the local Los Barrios fiesta was a relief from the constant sounds of flamenco and load pop music that blasted out of each casetas. Once past Malaga the next leg of 260 miles tour took us along the newly finished A45 autovia was a joy. Screen fully raised, a constant glance in the mirror for a possible unmarked police car, yes they have them as well! We clocked along at well over the legal limit – naughty but nice. 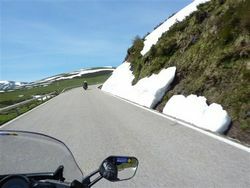 Sometimes you hit a road that reminds you why you ride a motorcycle, well, this was it. After Cordoba we joined the N432 and N502 to Almaden a stretch of road that has everything. It wound though dense pine forests whose trees had an unusual jet black trunks and a fragrance, which reminded me of Corsica. When the road opened out wild flowers edged the road one-moment mauve then the vista would change to yellow and white. Arrival in Almaden was a surprise to us all. We had not used this hotel before and we only had a photocopy brochure of the hotel to work by. I knew it was a converted bullring but it never registered with me that at 350 years old it was the oldest active bullring in Europe, great. Almaden was an ex mining town and the miners lived in rooms around and overlooking the ring. At first sight parking would have been a problem but the gates opened and we were able to use the ring as our own bike park. 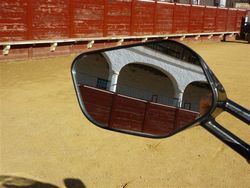 This was the unique opportunity of photographs of the bikes pictured against the yellow bullring sand with a backdrop of the arched terraces. Evening meals here were incredibly good, nothing fancy like goose barnacles but generous portions each night. Wine, coffee and water and some of the best crusty bread I have ever tasted. 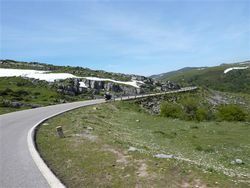 Moving on the next leg up to the Picos de Europa region bordered on 400 miles, some left early because of the long day ahead but no worries the road was good and as experience has told us 400 miles is easily attainable on Spanish roads. 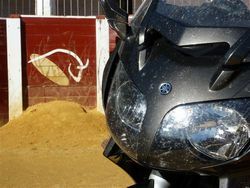 Try the N502 for size, yet another road on which is an absolute pleasure to ride a motorcycle. From Talavera the route headed towards Madrid branching off onto the N403 to Avila, Valladolid and Palencia. 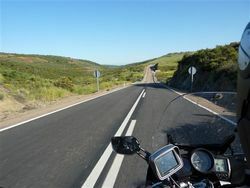 At Reinosa we took a white road on Michelin across Puerto de Palombera 1260ms. and down the C280 to Cabuerniga. Snow was banked up on the sides but apart from some wet patches the road was clear. This is a one car wide road, littered with hairpin bends and cow dung. It was the first time that I felt that the bike needed another set of gear ratios there being too larger gaps between gears, a sixth gear slipped in somewhere would have help to smooth out my ride. This final leg was one of the best. What a way to end a tour I thought as I arrived at the end of the C180 and our last hotel. The tour had everything, a diversity of landscapes, and a varied selection of hotels - ancient and modern, roads that demanded maximum concentration and others on which you would think you were the only person on the planet. Typically the final evening together was in true Spanish style with an enormous seafood paella washed down with a plentiful supply of cava. The table was left, as it should be after a good meal, empty cava bottles, broken lobster and mussel shells, screwed up table napkins a mess maybe but a great evening. On reflection the group had covered around 20,000 touring miles some had topped this with trips out on the free days. Nothing went wrong with any of the bikes not so much as a lamp blew. No illnesses, only one of the group spent an extremely tender day as a result of too much sun.